The weather finally abated enough for us to make our first run south to the town of Leirvik. Here we found a perfect pontoon - floating, good depth and length and easy access. 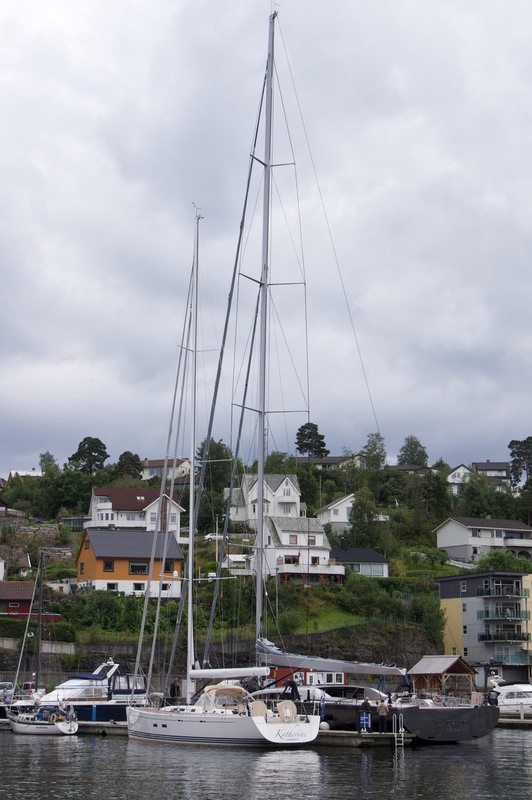 We were greeted on arrival by the lovely Norwegian Couple from the sailing yacht Gulli. We have been in harbours and passed them on the water throughout the season all the way to Lofoten - according to them 10 times! Apparently we also amazed them at some of the anchorages we would appear from on AIS. Lee is now going to have warm feet onboard with a pair of hand made socks presented as a gift. In Leirvik we also found ourselves no longer the big boat in the harbour - when a 33m yacht with a 50m mast parks alongside a 20m yacht suddenly looks very small. It was a pleasure to meet Clive the skipper of Win Win, a recently launched Baltic Yacht on its way to the Caribbean where she will be used primarily for racing and a bit of cruising. Like us Clive was determining the best time to launch across the North Sea and was also unimpressed by the weather systems hanging around. They made a successful run last Saturday for the Shetlands and are now on their way. 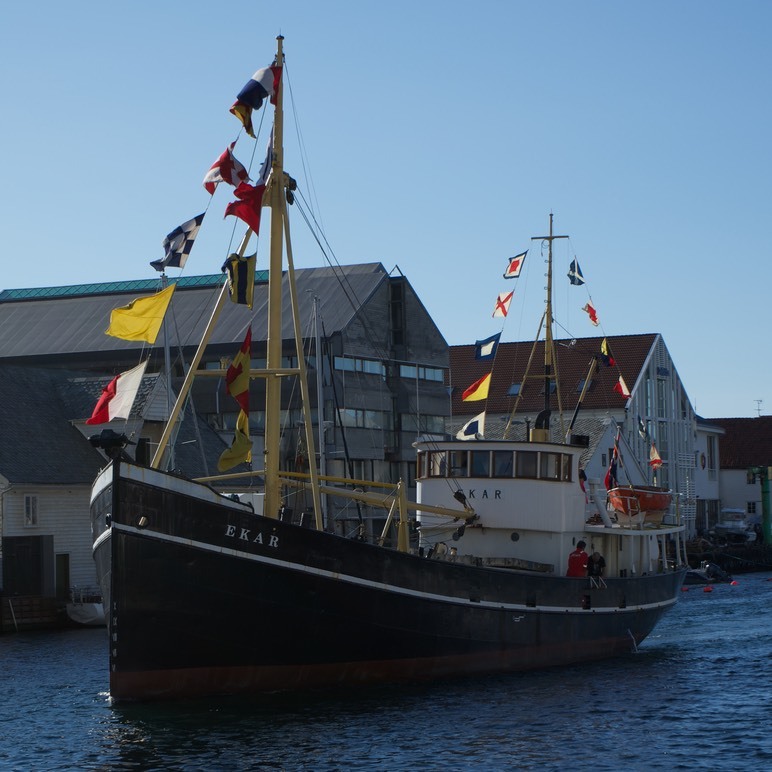 From Leirvik we continued south to Haugesand where it just happened to be the Timber Boat Festival. This meant we had to relocate from the main pier but thanks to a very helpful harbour master we found the last suitable space just south of the bridge. 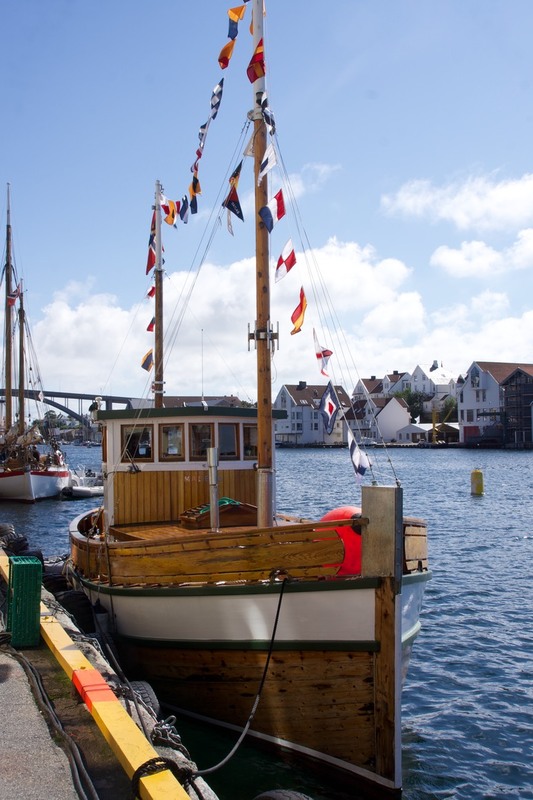 On the Friday evening we watched from the deck of a local cafe the flotilla of TImber Boats both large and small proceed down the channel to the applaud of onlookers. Haugesand is the place to be in August we were told with ongoing events throughout the month. The week before there had been an International Jazz Festival and the upcoming week was the International Film Festival for which many boats were already securing a berth for for the week to attend. 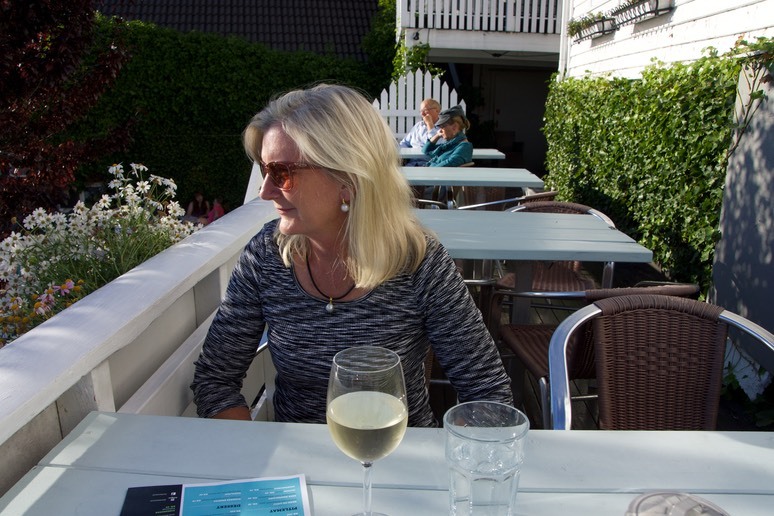 In hindsight we should have stayed to enjoy the festivities but we moved to our last intended port of call Stavanger believing that we would get a weather window to cross the North Sea to Edinburgh by today. Unfortunately the weather forecasts continue to be anything from encouraging with wind, rain and large seas forecast for at least another few days. So we will sit and be patient in Stavanger. We are in a quieter harbour outside the Petroleum museum a much better location then the main port where we sat last time we visited. 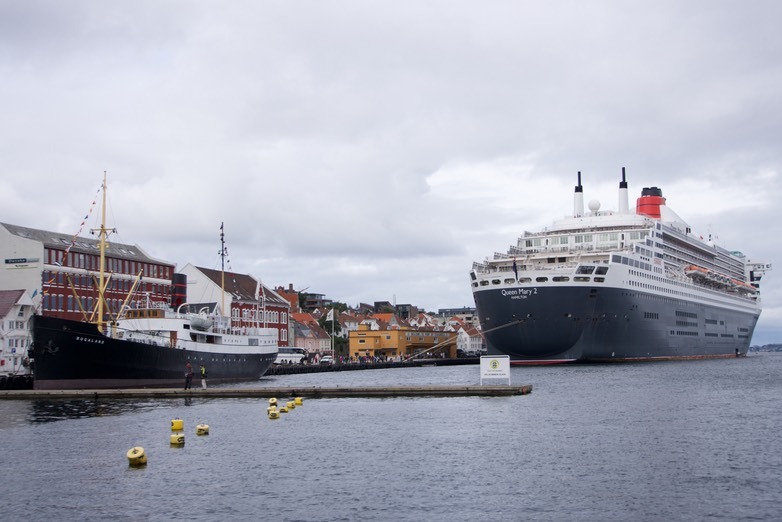 The harbour has been busy with both cruise ships and yachts many of whom are now sitting with us waiting for their opportunity to run south. Soon enough we will be crossing the North Sea, and experiencing the kilts, haggis and bagpipes of Scotland.